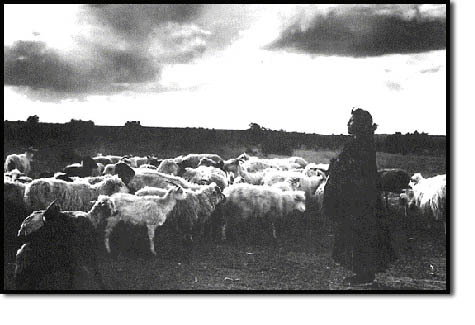 ... the first sheep were brought into the Southwest by Don Juan Onate. The fact that these sheep still exist today is a testimony to their endurance and endearment. No other sheep population in the history of the world has survived so much selective pressure with such dignity and spirit. The Navajo-Churro breed is considered a rare breed. The gene pool is presently large enough to maintain the breed type with the diversity of available unrelated lines. Fortunately for breeders, a well established network of registered stock is available, scattered throughout the US and Canada. These sheep with their long staple of protective top coat and soft undercoat are well suited to extremes of climate. 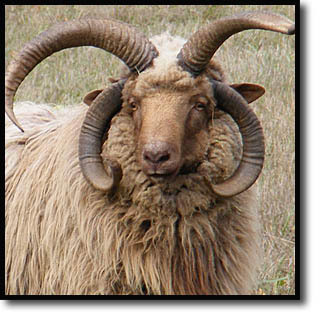 Some rams have four fully developed horns, a trait shared by few other breeds of the world. The Navajo-Churro is highly resistant to disease, and although it responds to individual attention, it needs no pampering to survive and prosper. The ewes lamb easily and are fiercely protective. Twins and triplets are not uncommon. The flavor of the meat is incomparably superior, with a surprisingly low fat content. Join us in conserving and promoting this heritage breed that still provides wool for the nation's professional fiber artists and is a vital food in many Southwestern homes. To find a breeder in your area, go to the Breeder List. To find fiber and related products, go to the Fiber List. To find raw fleeces, go to the Fleece Directory. To buy quality N-CSA logo items, go to the sales item page. Click here to download a PDF of the N-CSA Informative Brochure. Check out the incredibly informative DVDs on raising registered Navajo-Churro sheep. Click here.